I'm quilting again! It's about time! I decided there was no excuse good enough to keep me from doing what I truly love: the actual quilting process. I picked out two projects that have been sitting in my sewing room for literally years! The first is an all-machine made quilt that I started 3 years ago when teaching a year-long class at Country Dumplings quilt shop in Cimmaron, KS. My quilt "Aunt MiMi's Flower Garden" had received several major awards at national shows, and I was asked to teach the quilt as a project workshop. I knew how ambitious this project was, so I decided to challenge myself to make a second version along with my students. Many of the students finished their quilts years ago, but I'm just now getting back to mine. Right now, I'm finishing up the background quilting. Note the difference between the finished block below, and the block above that still needs the background quilted. 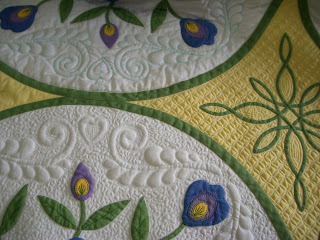 Doesn't the heavy background quilting make a huge difference in the appearance of the quilt? I quilt my quilts in what I call 3 passes. First, I do all the stabilizing stitching: stitch in the ditch around all the block outlines, and appliques. Second, I quilt the motifs: feathers, hearts, and other designs. Third, I fill in the backgrounds. I found that if I quilted everything all at once, that area would draw up, and I'd end up with pleating in other areas as I progressed out from the center, so I started doing it in passes. Here is my setup for machine quilting. I pool the quilt all around my favorite Bernina on the sewing table, and I have another smaller table to my left to catch the 'puddle' of quilt. The quilt portion that is under the arm of the machine is simply scrunched (technical term!) under the arm. I find that I need much more light than I used to, even though I had cataract surgery last year, so my goose-neck Ott lite is moved very close in front of me. I actually have the light positioned between me and the quilt, under my chin when I quilt. I can see exactly what is happening under the needle, and in the winter, the warmth of the light feels really good! Works for me! Then, there's my hand quilting project. This one was started probably 4 years ago, I really don't remember! I started this heavily quilted whole cloth project after I saw a spectacular antique quilt at Winterthur estate in Delaware. It was so amazing, I wanted to do a densely trapuntoed and quilted bed-sized quilt, too, so I designed this feathered and stippled project. 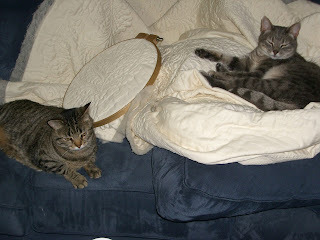 But it went on the back burner when I started the quilts for String Quilts book. I dug it out of the pile last week, and decided if all I can do is put 1/2 hour's worth of stitches a day, I will eventually finish this quilt. 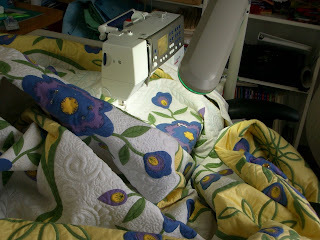 I actually recline when I hand quilt. Here is my current setup for hand quilting. I lay on my wonderfully comfortable family room sofa, padded with pillows under my head and feet. Another goose neck Ott lamp illuminate my work over my right shoulder. Husband sits to my right, and the television is in full view to my right. 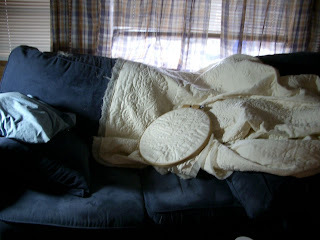 I bend my knees to support the hoop, and quilt in decadent comfort. When I am not lying on the couch quilting, guess who else gets to enjoy my hand quilting setup? My quilts are always laundered after I finish the quilting and before I block and bind them, so Sally and Gianni get to 'bless' the quilts with their loving caresses, too. Miss Sally and Gi lovin' the quilt! Wow! Beautiful!! Now, did you say you launder your quilt before you bind it? I would love to see your blocking and binding session when you get to it. I am new to quilting, and blocking is something I am not familiar with. It would be a good lesson before I get that far. 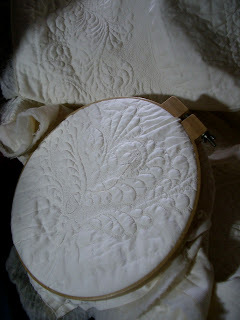 I am hand quilting.. so it will take me a while before I get that far. I don't block every quilt I make, but if it is one I intend to enter in competition, I want to make sure it is flat, and all edges are straight, same length, and everything is square and true. I 'block' it like I would a piece of needlework before framing. It is a long, involved process, but does make a difference in how it hangs in a show. I'll blog about it when I get to it. Thanks for your comments! Your quilting is just gorgeous - really makes Aunt MiMi's flower garden come alive. Thanks for sharing. Hi! Greetings from Finland! Your quilts are FANTASTIC!!! I am speechless! You are fantastic quilter! I am so happy to see quilters from the other side of the world! I have to come to visit again your Blog-site. It is very interesting!